Pages from History: 26 May 1914 Birth Centenary of of Rt. Rev. 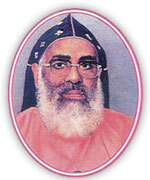 Thomas Mar Athanasius Suffragan Metropolitan. 26 May, 1914: Birth of Rt. Rev. Thomas Mar Athanasius. Thirumeni was born to the Panampunnayil family at Kottayam. He was ordained as a Deacon of the Church in 1944 and as Kassessa in 1946. On 20 May, 1953, he was consecrated as Bishop. He was designated as Suffragan Metropolitan in May 1978 together with Philipose Mar Chrysostom. He guided the evangelistic activities of the whole Church for many years. The college for women at Perumbavoor was established under his inspiring leadership. Thirumeni was called to eternal rest on 27th November, 1984.